Karaoke Studio Top Hit 20 Vol. 2 (カラオケスタジオ トップヒット20 VOL.2, Karaoke Studio Top Hit 20 Vol. 2?) is the second and final expansion cassette for the Karaoke Studio music game designed by Bandai in 1987 for Nintendo's Famicom. It provides additional songs and other new content by plugging it directly into the Karaoke Studio subsystem. As an expansion, it does not come with the microphone peripheral provided by the base package. Gameplay consists of singing along in a karaoke-manner to a series of Japanese pop songs. The player is scored on accuracy of singing. 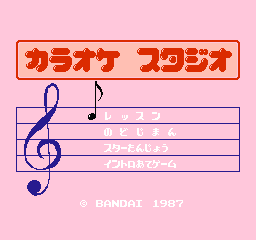 The songs have been converted into 8-bit format for use with the Famicom and as the music plays and the song's lyrics are shown, on-screen depictions of the song's themes are displayed in the background simultaneously.